African Grey Parrots love their toys! African Grey Parrots love toys! Toys they can chew on, shred, untie knots, take apart, puzzles, wiffle balls, bells and toys they can hang onto. 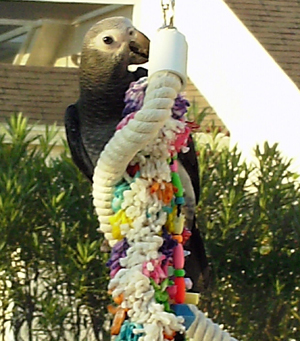 African Grey Parrots are highly intelligent and need toys to keep them busy. They get bored easily and need stimulation. It is amusing and downright entertaining when you get to see an African Grey Parrot in the midst of playing. African Greys play hard and can be having such a good time that they sometimes forget to hold on and fall from their perch. 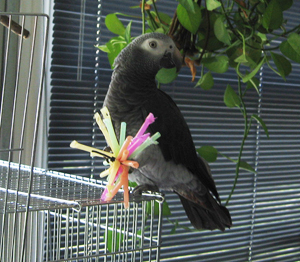 Use your ingenuity and create toys out of normal household items to help keep your African Grey Parrot busy. 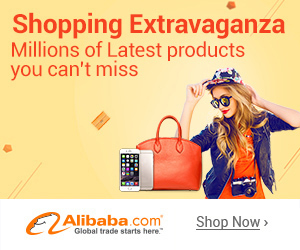 Wine bottle corks – real ones only! Large stainless steel bolts and washers – make sure they're clean. Note: stainless steel only, other metals can be toxic. 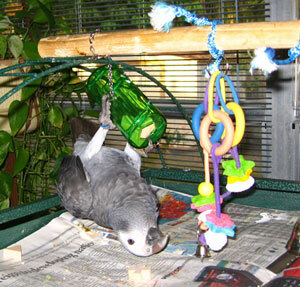 Toys help keep our African Grey Parrots happy, healthy and curious. Let's hear it for toys!